Peter Matkovich’s experience as a player and course superintendent, combined with his passion for the game was a natural catalyst in his evolution to golf course architect and designer. An avid conservationist he follows the principals of “nature first” and it shows in the care and attention to detail at every one of his courses. With more than twenty new course designs and a further twenty major course renovations he brings a wealth of experience to every course he designs. Upon arrival at Johannesburg International Airport, you will be met by a friendly African Fairways representative and assisted with a private three-hour road transfer to the Botsebotse Game Lodge in the Bela Bela region of Limpopo. This exclusive bush retreat is situated in the malaria-free Zebula Game and Country Reserve. There are no predatory animals at Botsebotse, so it’s an ideal environment to explore on foot or mountain bike, commune with nature and grow your love of South Africa’s natural splendour. Your three nights’ accommodation at this five star lodge is on a dinner, bed and breakfast basis. Over the next two days you will experience the South African bushveld at her best –from the fairways of two of South Africa’s most acclaimed bushveld golf courses. It is a rare treat to find two spectacular “must play” courses in such close proximity and the chance to play at Elements Golf Course and Zebula Country Club should not be missed. Elements Golf Course ensures an enjoyable challenge for all levels of players, but you will need to play a strategic thinking game and give careful consideration before selecting your driver. 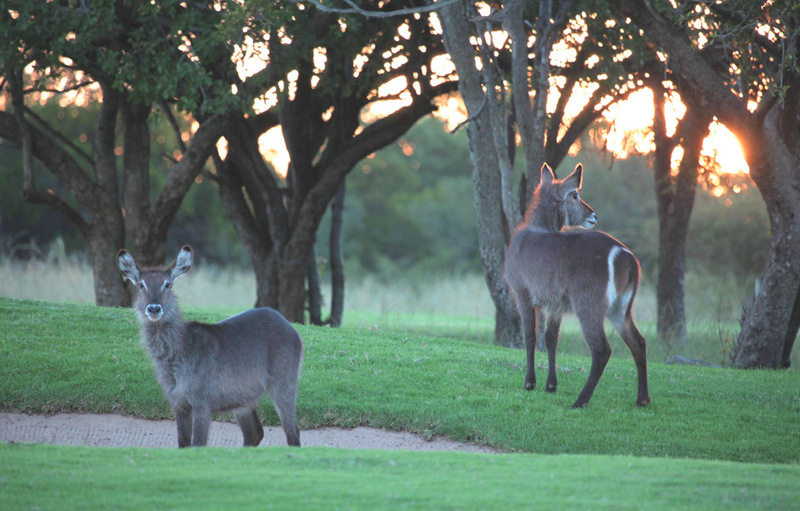 It is a spectacular bushveld course where even at its busiest you will feel like the only player on the course. 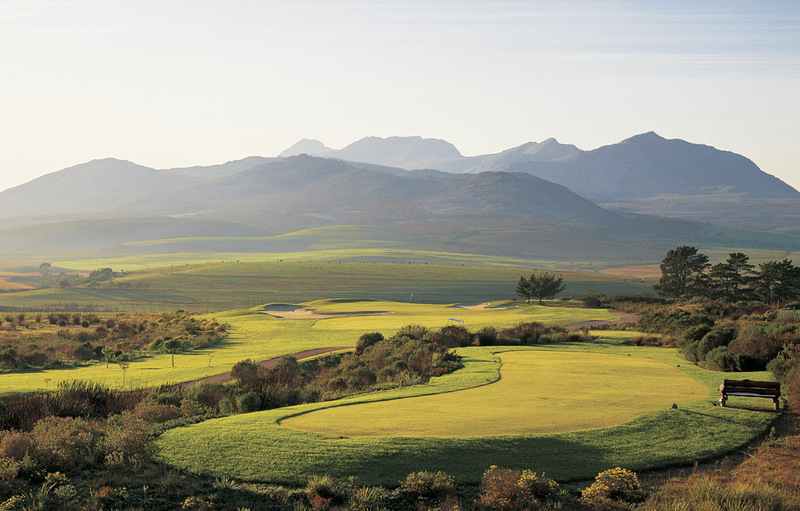 The sublime Zebula Golf Course rolls out across the open plains of the reserve where herds of game roam freely. With luck you’ll experience a magical encounter with a shy zebra, a lofty giraffe or two, or spot some of the resident Waterbuck. 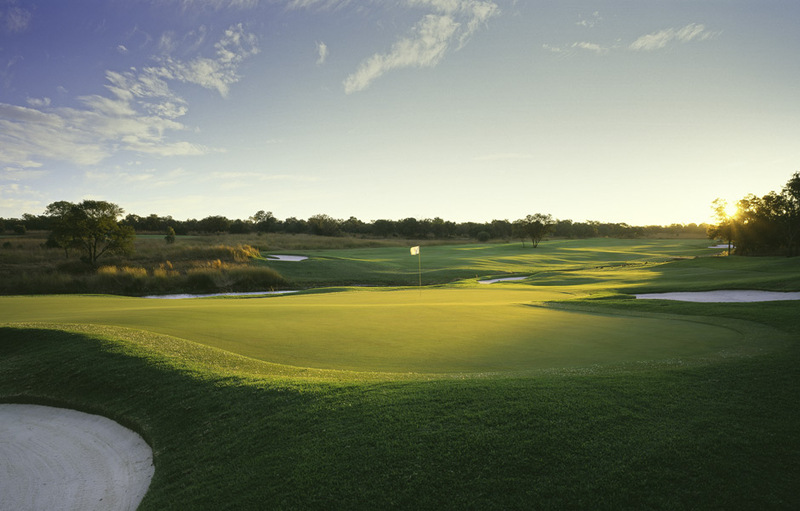 This par 72, classic Bushveld course invites you to play on its generous fairways with clusters of trees forming natural hazards on the undulating course. After an early morning start, you will be transferred back to Johannesburg International Airport where you will board a flight to Cape Town International Airport. A ninety-minute road transfer takes you from Cape Town to South Africa’s sublime whale watching capital - Hermanus. Here you will spend two nights at the Ocean Eleven Guest House on a bed and breakfast basis. This beautiful Cape Cod, colonial guest house sits atop the famous cliffs of Hermanus. This charming boutique hotel offers bed and breakfast accommodation in 10 beautiful sea-facing suites. The graceful home boasts high ceilings, tall windows and teak floors and enjoys encompassing vistas of Hermanus’ Walker Bay and the picturesque mountains beyond. In-season, guests staying at Ocean Eleven will experience some of the best whale watching in the world, right from the comfort of their suites. 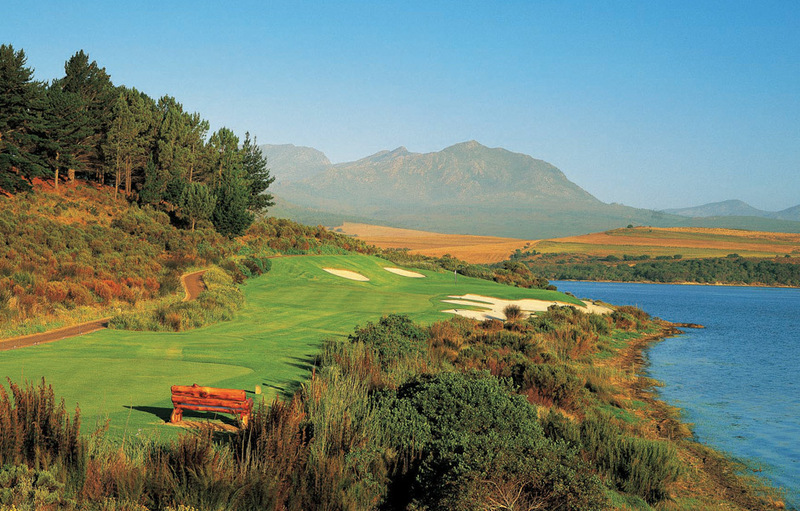 On day five you’ll play the breathtaking Arabella Golf and Country Estate which laps the shores of the Botrivier Lagoon. The estate and course is home to a variety of spectacular fauna and flora including 147 bird species and the odd wild antelope. Your afternoon is at leisure; why not enjoy a sensual Spa experience or try some of the other interesting and exciting activities on offer in the area including like guided walking trails through the Rooisande Nature Reserve, visit the Kogelberg Biosphere, go horseback riding, canoeing or mountain biking. For the extreme adventurer there is even shark cage diving. A scenic country drive of roughly 45 minutes, through Sir Lowry’s pass, takes you to the famous Wineland area of Stellenbosch. Stellenbosch is one of the oldest and best known wine regions in South Africa. It dates back to 1679 and is home to popular wine estates such as Beyerskloof, Lanzerac, Delheim, Zonnebloem and Kanonkop but to name a few. Your accommodation for the next two nights will be at Majeka House on a bed and breakfast basis, with dinner as an optional extra. Extensively renovated in 2011, Majeka House is a picture of contemporary elegance and quiet luxury. The sprawling five-star boutique hotel seamlessly combines old world style with a fashionable contemporary twist. 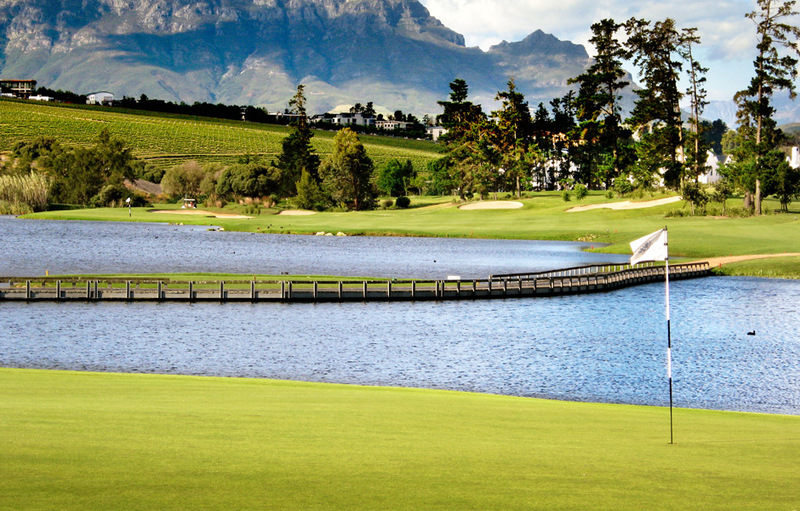 You know you’re in wine country when you find yourself teeing-off on De Zalze’s gorgeous Golf Course with fairways lined with beautiful vineyards, olive groves and lavender fields following the meandering oak-lined Blaauwklippen River as it weaves its way through the valley. Your afternoon is at leisure to explore this university town. Stellenbosch is world renowned for its many wine cellars and fine cuisine. It is also a town steeped in early settler history and has numerous art galleries and boutique shops. For a truly unique gastronomic experience, why not try a Mushroom and wine Pairing/Tasting at the South African Mushroom Academy. Moving back to the ‘Mother City’, you will be stopping off at the Four Rosmead, which is nestled on the slopes of Table Mountain. Four Rosmead, built in 1903, is a provincial monument, which has been sensitively and stylishly re-modeled into a small exclusive guesthouse. Boasting 360 degree views of Table Mountain, Lion’s Head, Signal Hill, Table Bay and the city this Cape contemporary classic has a rich history. Relax on loungers next to the swimming pool and enjoy the landscaped gardens or treat yourself to a session at the onsite Pamper Spa. Explore Rosmead’s Art Gallery, where most of the carefully selected items, crafted by local South African artists, are available for purchase. Your Accommodation is on a three nights’ bed and breakfast basis with dinner as an optional extra. 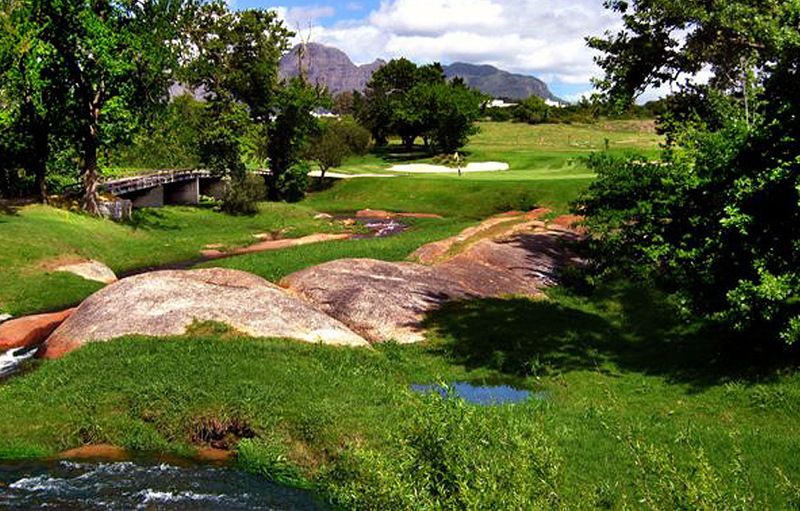 Take in the views on the Steenberg Golf Course as it hugs the slopes of the Steenberg Mountains in the idyllic Constantia Valley and meanders its way through the Steenberg vineyards, pine forests and gentle waterways. Your afternoon is at leisure – visit the Steenberg Vineyards, Table Mountain or lie back on the golden sands at Camps Bay Beach. For a taste of Cape History you can tour Robben Island, the Rhodes Memorial or Signal Hill. For nature lovers there is the Two Oceans Aquarium, Drakenstein Lion Park, Boulders Beach, Kirstenbosch National Botanical Gardens or the Cape Point Nature Reserve. We know it’s hard to say goodbye so why not say ‘see you soon’. Your private road transfer will return you to Cape Town International Airport where you will board your flight back home. 2 Night stay at Ocean Eleven Guest House on a bed and breakfast basis.